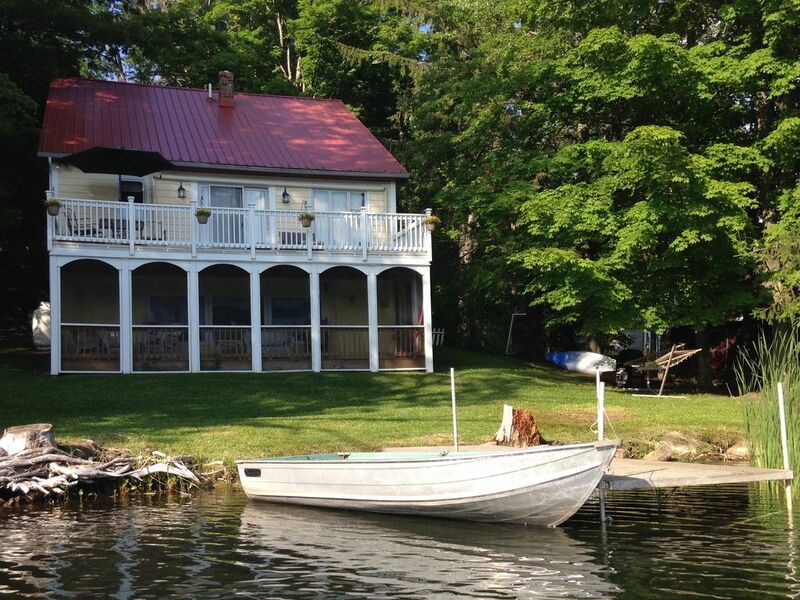 Windsor Cottage is a relaxing, lakeside retreat located on Windsor Lake in North Adams, MA where you can enjoy your own private waterfront! You will feel like you are in the middle of the forest, yet you are in walking distance to the town, Mass MoCA and Massachusetts College of Liberal Arts as well as many bars and restaurants. In addition, it is a 10 minute drive to Williamstown, Williams College and the Clark Art Museum. Wander through ancient forests on a hike up the tallest mountain in Massachusetts, Mt. Greylock, visit several nearby treetop adventure parks or go white water rafting on the Deerfield River. The lake offers non-motorized boating, swimming and spectacular fishing. A row boat, a canoe and a kayak are available for you to explore the lake and take in the views of the Hoosac and Appalachian Mountain ranges, including Mt. Greylock. On Wednesday evenings in the summer you can sit on your deck and enjoy concerts that are held in the pavilion across the lake. There is a public swimming area with lifeguards, a snack bar and a playground across the lake as well. The home offers a large great room for relaxing and dining, a fireplace, a full kitchen that is well equipped for all of your cooking needs, one and a half baths, comfortable beds with brand new pillow-top mattresses, a huge deck and a spectacular screened in porch where you can relax the night away or take a nap on a unique, twin sized porch swing. Spend a cozy evening cooking s’mores around our outdoor fireplace or cook dinner on our outdoor grill. You can entertain yourself and your family with a multitude of games, a ping pong table and over 200 videos. Cable television is provide as well as wifi. Cell reception is excellent. Windsor Cottage is a great place to enjoy all of what the Berkshires and Southern Vermont has to offer as the only three bedroom lakeside rental property in the North Adams/Williamstown area. We purchased Windsor Cottage in September 2013 from the couple who built it 35 years ago. It was a well loved family retreat, but had not been updated since it was built. Despite the decor, we recognized it as a very special place. We have spent the past 9 months bringing it into the 21st Century, while striving to make it inviting and comfortable. For fun and comparison, we have displayed pictures of each room prior to the renovation throughout the home. Everyone who has visited the cottage has given us very positive feedback. We have decided to share the home with others so that they can experience the unique beauty and tranquility of Windsor Cottage as well. My husband and I grew up in the Berkshires and we both have fond memories of time spent at Windsor Lake. When the rare chance to purchase one of the few lakeside properties came up we jumped at it. North Adams is the smallest city in Massachusetts, but there are hundreds of cultural and natural attractions in the area and Vermont is only about a 15 minute drive North. No matter what you want to do, golf, ski, shop, tube, fish, take in a play, visit a museum or take a scenic drive, you can do it from here. If you want to visit a big city we are only 2.5 hours from Boston or 3 hours from New York City. Our location truly encompasses the best of both worlds! We fell in love with this property immediately when we walked in the door. There is something special about the place. My favorite pastime is to sit and watch the water and see how it changes from day to day and moment to moment throughout the year. The house has been designed for relaxation and enjoyment. toilet, combination tub/shower, This bathroom is on the first floor. toilet, This bathroom is on the 2nd floor. Please provide your own towels. Thank you. About one mile away down a steep hill you can enjoy downtown North Adams and several restaurants and bars, as well as Mass MoCA, Massachusetts College of Liberal Arts and several other small museums. You can hike, boat, x-country ski, and fish from your doorstep. In walking distance to downtown North Adams and Massachusetts College of Liberal Arts. If you row out to the middle of the lake you can see Mt. Greylock, the real life setting of J.K. Rowling's fictional Ilvermorny School of Witchcraft and Wizardry. You can swim, fish or take out the provided rowboat, kayak or canoe. A full kitchen with all of the pots, pans, storage containers, etc. that you will need to prepare home cooked meals. We also provide a large electric griddle, a blender, a toaster and a crock pot. Blue Tooth Soundbar that you can connect to your devices for excellent sound quality. You are welcome to bring your own movies or you can borrow one from the local library which is 1 mile away. Over 200 titles to choose from. We have tapes of every genre including just about every Disney movie. A one person kayak is available to use at your own risk. Life jackets are provided and are required. A large rowboat is available to use at your own risk. Life jackets are provided and are required. This is a lovely and well-cared for property that feels like home. The owners clearly love this home and it shows. A fine location for all things North Adams and beyond. The early morning views of the lake over a cup of coffee are not to be missed! The road in is a bit rough so take it slow. All in all, a very special place. We appreciate guests like you that return and treat our property as if it were their own. We strive to make Windsor Cottage warm and inviting and we add a little something new each year. With the new utility lines coming in, the city will also be making road improvements which will make for a smoother ride. Thanks again for enjoying and appreciating our little piece of tranquility and please continue to come back and visit!! My family and I really enjoyed staying at Windsor Cottage. It was roomy, comfortable and had everything we needed. I especially loved the swing on the downstairs deck. My 17 year old son loved, loved, loved the fishing. We will definitely be looking to stay there again next year. Thank you so much for taking the time to write this wonderful review and thank you for staying with us. We love the swing too. I just bought a new set of big plush pillows for it for even better naps!! Our stocked lake is a favorite with many locals and tourists as well. I am so glad that you enjoyed your stay and we look forward to seeing you again!! Windsor Cottage was clean, relaxing and turnkey convenient! We have 5 year old twins and invited my parents to stay in the cottage with us. There was plenty of room for everybody and then some. The camp and park grounds across the lake were perfect for kids and adults. Well kept open grassy fields for fun and a beautiful little swimming area. Didn't do much fishing but other folks were out every night. Standup paddle boarding and kayaking would be fun on the lake too. The cottage was stocked with everything you need and if you have to go out for supplies, it's a 5 minute trip to the local stores. The setting is quiet and private and the view from the deck or screened in porch is awesome. This was a great place for us to go with small kids. The swimming next to the dock was just enough to keep the kids busy all day. Windsor Cottage is highly recommended! We are very happy to hear that your children enjoyed the cottage and the park across the lake! The variety of free concerts on Wednesdays and the abundance of hiking and water activities can keep adults and children very busy enjoying the outdoors!! Thank you for your review and for choosing Windsor Cottage! We enjoyed being right on the lake and having both a canoe and kayak to use on the lake which we did every day. It was interesting to watch the people at the park across the lake a especially the children attending the Y camp. Although we did not fish, we saw several who were and the fish were biting. There is much to do in the area including Mass MOCA, swimming, hiking, biking and golf -- all of which we enjoyed. We are very happy that you enjoyed the lake. It is so nice to not have to worry about big motor boats and just being able to row or float around at your leisure. We also enjoy the sounds of happy children enjoying being outside across the lake. I hope you can come back sometime and explore even more of the beautiful Berkshires! Very well maintained home with ample kitchen supplies located on a small scenic lake flanked on one side by mountains. You can swim across the lake right from the backyard, or canoe, or take the rowboat. The house has two great porches, one open and one enclosed with great lake views, as well as a comfortable indoor living/dining area. The bedrooms are very comfortable and it’s very quiet at night. There’s easy and quick access to North Adams, Williamstown, hiking trails, Mohawk trail, and restaurants. We enjoyed our four night stay very much. Thank you for staying at our cottage and we are so glad that you enjoyed the tranquil beauty. We try to make the house all about relaxation and enjoying nature and it sounds like you did just that! I truly loved our weekend at this home away from home. The location is wonderful and the house is clearly well cared for. So nicely decorated and exactly as described in the postings. The view from the deck and screen porch are so relaxing and renewing. Terri was wonderful to work with and provided all the information that we needed to ensure a great weekend. Really, top notch from beginning to end! Thank you so much for your great review and for visiting Windsor Cottage. Every year we add something new so please come back and visit again sometime!! Please provide your own sheets, pillowcases and towels. There is one queen bed, one double bed and four twin beds. **Due to insurance purposes, we are unable to allow more than the house maximum of 8 people (including children) on the property at any time. Therefore, we cannot allow the use of Windsor Cottage for reunions, family gatherings or parties that exceed 8 people. We do not charge extra fees for boat use or cleaning.